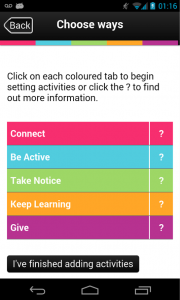 The Five Ways to Wellbeing app, developed by Somerset Public Health, helps people improve their well-being through everyday activities No rules, no regulations. Taking the renowned Five Ways to Wellbeing developed by the new economics foundation into the digital world, the free app gives anyone with an iOS or Android smartphone a chance to reflect on their wellbeing, set activities to help improve their wellbeing and track their progress – all from the comfort of a phone. 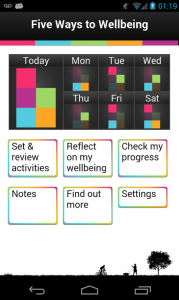 Download the Five Ways to Wellbeing app for free from the Google play and Apple App Store. Keep track of how many activities you’ve completed and earn trophies as you go!